Kim K. Gandhi, D.D.S, P.A. Dr. Gandhi has been in practice in Palm Beach County since 1993. He stays abreast of the latest techniques and technology. Dr. Gandhi belongs to and is past President of The Central Palm Beach County Dental Society teaches at Atlantic Coast Dental Research Clinic on the topics of Periodontics and Implants (also past president of the research clinic), Florida Dental Association, and the American Academy of Periodontics. In his spare time he enjoys traveling, reading, tennis, scuba diving, and skiing. Dr. Gandhi was born and raised in southeast Wisconsin. He completed his undergraduate education at the University of Wisconsin and then received his postgraduate specialty training at Loyola University in Chicago, IL . After completing his residency, he was commissioned as an officer in the United States Navy working as a Periodontist and clinical instructor at Miramar Naval Air Station, San Diego, CA and in the far east including Japan and Korea. Sara has been in business administration for 10 years, starting in veterinary medicine and transitioning over to dentistry. She started in the dental field as Dr. Gandhi’s clinical assistant before changing back to the business side of the practice. Her combined experience of clinical and patient services makes her a true asset to the team. Sara strives for patient satisfaction by always being upfront and honest. In her free time Sara enjoys reading, Netflix, running, paddle boarding, and spending time with her husband, family, and rescued fur babies. Arliss brings a strong background of knowledge in dentistry and dental insurance. Her goal is to help patients utilize their dental benefits to complete their dental treatment for that healthy perfect smile. In her spare time, she enjoys reading, and antiquing. Gabriela has been a dental assistant for 15 years with her passion in periodontics and oral surgery. Gabriela is certified by the Dental Assistant National Board and she stays current with continuing dental education. This is a commitment she takes seriously to help her patients maintain their dental health. Gabriela ties her knowledge with her gentle bedside manner in a way that makes patients comfortable and confident. When not working alongside Dr. Gandhi, Gabriela spends her free time with her children and husky Luna. She loves photography and tending to her orchids. 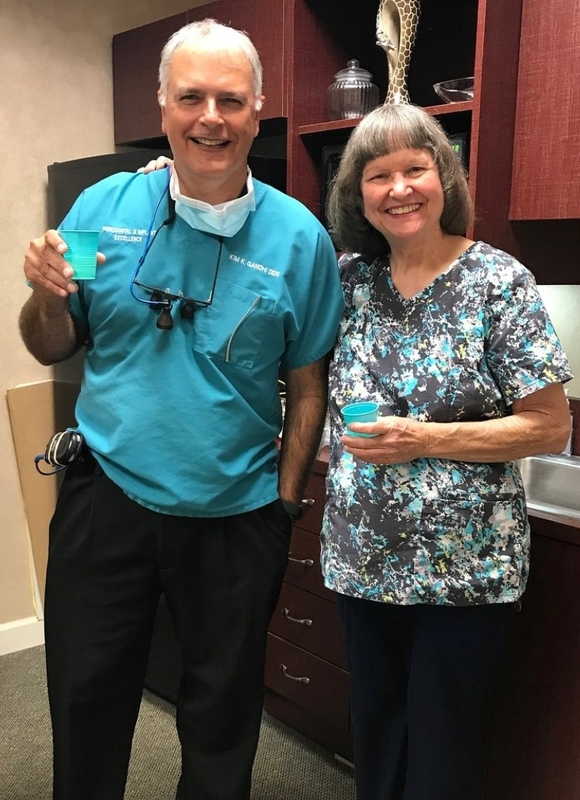 Sharon is not only a native of West Palm Beach but she has been with this periodontal practice from the start, 50 years ago. When Dr. Gandhi acquired the practice in 1992, Sharon “Came with the equipment” as she loves to tell patients. Her philosophy as a hygienist has always been that the health of the mouth affects the health of the entire body. Sharon is a woman of integrity and has always been committed to dentistry and the patients that come through the door. In her free time Sharon loves to read, spend time with her family especially the new addition of her great niece, and being with her four rescue cats. Denise has been practicing clinical dental hygiene for 24 years and the last 11 years have been with our practice. Denise enjoys helping her patients achieve the healthiest gums and teeth possible aspiring to make the mouth-body connection. Denise embraces the needs of her patients and strives to provide the best results in periodontics. In her spare time Denise enjoys playing tennis, boating, and traveling. Spending time with her husband and two children makes her smile.